In Part One of our interview with Rochette Dahler, founder and CEO of the Little Sunshine’s Playhouse franchise system, Ms. Dahler explains her innovative childcare concept on the consumer level, and describes the benefits it provides to parents and children. Part Two will focus on the Little Sunshine’s Playhouse franchise opportunity, the benefits it provides and what it takes to be awarded a Little Sunshine’s Playhouse franchise. Top New Franchises: Rochette, how do you describe the Little Sunshine’s Playhouse concept? Rochette Dahler: The Little Sunshine’s Playhouse concept is the innovative, educational childcare solution that many parents have been searching for. Our Little Sunshine’s Playhouse facilities are enchanting and fun, and our curriculum is fresh and engaging. We have effectively harnessed the latest technology to heighten parental involvement and satisfaction levels, and to ensure the safety and security of our children. While our most obvious role is to provide high quality childcare to children from 6 weeks to 6 years of age, we see ourselves as primarily being in the relationship business. We value our customers, students, and our staff members, and maintain a home-like atmosphere and family-oriented philosophy in all we do. Top New Franchises: Who are the customers for Little Sunshine’s Playhouse? Are you catering only to upper income professionals? Rochette Dahler: Most of our clients are well-educated, upper-income professionals, but we’re also attracting a growing number of middle-income and two-earner families. The common thread between all of our parents is that they value early childhood education and are willing to invest in their children’s early care. Today’s parents are willing to drive farther, invest more, and rally behind a school that they and their child feel connected to. We understand the sacrifices parents make to provide the best for their children, and the emotion involved in entrusting their child’s care to a childcare provider. We take that trust seriously, so we strive not only to have our operations down to perfection, but also to maintain the home-like environment and personal connections that take educational early care to the next level. We don’t believe that having a child in preschool means that parents and grandparents must feel disconnected from their child during the day, or that they must miss out on important events and milestones in their children’s lives. For this reason, we have adopted the latest technology to maintain a digital link between parent and child through such innovative programs as LuvNotesTM & Kiddie CamsTM. Top New Franchises: Before we get into LuvNotesTM & Kiddie CamsTM, tell me about the Little Sunshine’s Playhouse buildings themselves. They are strikingly beautiful, both inside and out. Are you intentionally trying to break away from the sterile and school/institutional feel of most childcare centers? Rochette Dahler: Absolutely! Parents have fewer children than in past generations, and have their children later in life. Their children are the most important part of their lives, and they want the very best for them. Yet most childcare centers look sterile and institutional at best, with loud primary colors. Our parents remark that they feel good bringing their children to Little Sunshine’s Playhouse, because it combines the wonder and fun of a fairytale environment with the warmth and safety of home. 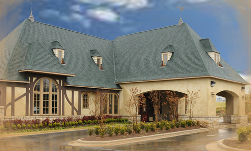 Our building exteriors and interiors are our best marketing, as they clearly set us apart from the competition in every market we’ve entered. But they’re more than that. Little Sunshine’s Playhouse facilities communicate our passion for excellence and innovation, and reflect the respect we have for our students, their parents, our franchise owners and their staff. We believe that our children deserve the best environment in which to develop, and their parents deserve to feel that they are providing the best. We demand the best from our staff, and believe that they deserve an attractive and efficient work environment. And we believe that the franchise owners who have invested personally and financially in Little Sunshine’s Playhouse deserve to own a business they can be proud to call their own. In addition to their attractiveness, Little Sunshine’s Playhouse centers are designed to provide an optimal environment for child development, socialization, learning, exercise, health and security. Our professionally-designed facilities feature a theatre stage, a landscaped nature center for healthy, outdoor play, a variety of customized, age-appropriate playground equipment, and many areas for small-group learning and play. Top New Franchises: Earlier you mentioned LuvNotesTM & Kiddie CamsTM being two unique advantages for parents provided by Little Sunshine’s Playhouse. Can you explain? Rochette Dahler: From the beginning, we wanted the Little Sunshine’s Playhouse concept to exceed not only the needs of our children, but of their parents as well. A major problem with traditional childcare is that it leaves parents feeling disconnected from their children during the day. It also leaves them with a sense of loss when they have missed out on important events or accomplishments. We have kept our parents feeling connected with their Little Sunshine’s Playhouse students with early adoption of the latest technology and tools. In our first centers, ten years ago, we installed full color, secured video cameras in our classrooms and playgrounds. We call them Kiddie CamsTM. Using secured, password-protected accounts, our students’ parents and grandparents can sign on to our real-time, live video stream from their computers, iPads, tablets or smart phones any time of day, from anywhere in the world. They can watch their children as they work and play, and feel confident that they are in a safe, productive and fun environment. Parents love our Kiddie CamsTM! Top New Franchises: And what are LuvNotesTM, and what benefit do they provide? Rochette Dahler: Little Sunshine LuvNotesTM is a new feature we just developed to keep parents engaged and feeling connected with their children and the Little Sunshine’s Playhouse community. LuvNotesTM are an electronic daily communication sent directly to parents via email. Parents receive LuvNotesTM throughout the week that contain instant updates and daily sharing of photos and videos inside the classroom. So, instead of the teacher reading on a sheet at the end of their child’s day “Suzy had Spanish class today,” our LuvNotesTM provides a link that allows parents to watch a video of Suzy speaking Spanish in that day’s class. LuvNotesTM represent a major evolution in the way parents and teachers will communicate. It makes mom or dad feel like they are still participating in their child’s development, and enables them to congratulate their child on the day’s accomplishments. And what parent wouldn’t be excited to get LuvNotesTM from their child during the day? While LuvNotesTM & Kiddie CamsTM are benefits that parents love about Little Sunshine’s Playhouse, they are just two examples of our commitment to using the latest technology to enhance the parent-child-teacher relationship. As new technologies and communication media emerge, we will continue to provide new, cutting edge tools to our franchise owners to help them serve their customers and build their businesses. Top New Franchises: What is the real magic behind the Little Sunshine’s Playhouse concept? 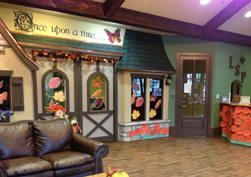 Rochette Dahler: Little Sunshine’s Playhouse is a magical place that’s designed to make children feel like they’re stepping into the pages of a storybook with every visit. But the real magic is created by the relationship between parents, teachers, franchise owners and all who have had a hand in developing the Little Sunshine’s Playhouse concept. It’s a relationship that’s forged from the common goal of providing an uncommon early learning foundation for the children who represent our future. Helping children be their very best, and rewarding parents for providing the very best, is what Little Sunshine’s Playhouse concept is all about. And that’s the real magic behind Little Sunshine’s Playhouse. Over 2 years ago I began my career with Little Sunshines Playhouse and Preschool as a Pre-K teacher, after spending over 18 years in the field of Early Childhood Education. I found Little Sunshines to have exactly what I was looking for: quality early childhood education, and a warm, loving, secure, environment. What I did not know was that not only was this a truly exceptional preschool, it is owned by a truly remarkable couple, Rochette and Matt Dahler. Rochette is a truly driven entrepreneur with a great vision of what early childhood education should be like. Matt, her husband, is the type of owner that understands the importance of personally calling the staff just to check in and share his appreciation; this is rare in my experience. Six months into my career with Little Sunshines I was promoted to Assistant Director at the Scottsdale School. I eagerly accepted the position knowing in my heart that this company is going far. As I got to know the management end of the company I realized what an amazing core group of people there are running it at the top. Only 6 months later the opportunity to become the director of my location came up and again I seized the opportunity with confidence. As a director of the Scottsdale school I have had the chance to get to know the upper management team more intimately, specifically Nicole Carr, the Corporate manager, who is a fantastic role model for directors like myself and my respect for her is very high due to her knowledge and management style. I cant forget Julie Hayes, the Corporate assistant, because she is there for me on a daily basis for support and assistance with the day to day operations of my school. My respect for the strategies and goals of the organization has only become stronger, especially in recent months, with the cutting edge Luvnotes electronic daily reporting system, and the rapid expansion of the franchise side of the business. I have had the distinct pleasure and honor of working for Little Sunshine’s Enterprises since July 2008. In that time, I’ve fallen in love with our company and have developed a strong sense of respect for founder and CEO, Rochette Dahler. She is not only a phenomenal leader and visionary for our team, but she is also a well-respected professional in educational childcare industry and franchising world. Rochette’s story of how she began a grass-roots business and turned it into what it is today is truly moving. Through hard work and a deep-rooted passion, she has successfully grown LSP into a well developed franchise system that is continually evolving with a strong commitment to excellence and through the use of cutting-edge technology. We are also very fortunate to have a strong team of dedicated individuals who sincerely love and care for Little Sunshine’s and who strive to find unique ways to add benefit to our program. Thank you to everyone who helps make our company so great! 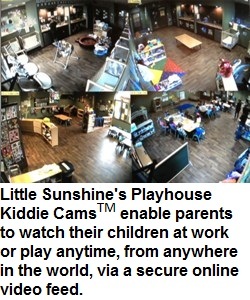 I have had the wonderful privilege of working for Little Sunshine’s Playhouse since March 2009. In February 2009, I made the decision to go back to work after being a stay at home mom with my first child since 2007. I researched many different preschool programs online in search of a company with similar beliefs to my own regarding early childhood education. I knew that I wanted to find a company that I could grow with. When I came across Little Sunshine’s Playhouse and Preschool’s website I was extremely impressed by the company’s philosophy and history. I found Rochette’s story so moving and was looking forward to becoming a part of her team! In March 2009, I began my career with LSP as an Infant Teacher. I quickly fell in love with the company and knew I was working for the right group of people. Within 6 months, the opportunity of becoming Assistant Director was presented to me. I quickly accepted this position knowing that this company was growing and had already exceeded my expectations of early childhood! It was only a short 6 months later that another amazing opportunity of becoming the Director of one of the Springfield locations came to me. I accepted the position once again! One year into my career with Little Sunshine’s I had already developed such a big place in my heart for this company! Over the last 3 1/2 years, I have been able to really get to know Matt and Rochette, not only on the business level but a personal level as well. They are such a wonderful couple and truly go above and beyond to make their team feel welcome and loved with this company! I think back to when I made the decision to work for Little Sunshine’s and I am so thankful that I made what I now know was one of the best decisions for myself and my family! This truly is an amazing company to be a part of! I’ve known Rochette for over 10 years now. I started my career with LSP at the first location that opened in 2002. I worked at that location for 8 years before moving to the Little Sunshine’s Enterprises corporate office in 2010. I really enjoy the ability to work with all of our schools and watching our new schools open and thrive! Rochette is truly an amazing person! She is not only my boss, but she is my friend! The time and effort that she puts into Little Sunshine’s is unbelievable. I know for a fact that it is on her mind all the time! The schools are beautiful, the staff is caring and nurturing and our constant growth is a true blessing. I love this company and I am so eager to see where our next journey takes us! I became a part of the Little Sunshine’s family in August of 2008. I started my career at Little Sunshine’s as a Pre-Kindergarten teacher. In early 2009 I was promoted to Assistant Director. I then received a second promotion as the Program Director in August 2009. In my experiences with Little Sunshine’s I can say with confidence that I work for the best preschool program I have ever seen. My daughter, Payton currently attends Little Sunshine’s. There are so many features that Little Sunshines has to offer that many other programs do not such as, the Kiddie Cam’s and LuvNotes. The Kiddie Cam’s are great because when I am not able to be at the center I can still watch her throughout the day. Another new feature that I have fallen in love with is the LuvNotes. It is truly a joy to be able to read how my daughter is doing every night. It is also great to see her in action. The company is always open to the newest and most up to date way to keeping the parents involved. The teachers that are hired to work in our program are continually trained throughout the year. It is great to know that my child is in the care of the best possible teachers for her needs. It is also a joy to know that I have so much continued support not only from the teachers, staff and parents at my individual center also, extending into the corporate level. My journey with Little Sunshine’s Playhouse began in August of 2005. I remember walking in for my first day of work as an Assistant Teacher in a toddler classroom thinking that when I have children of my own I would love for them to attend a facility that was as inviting and nurturing as what is now known as Little Sunshine’s Playhouse- Springfield I. From the very start I knew that I was part of a company that would grow and be a leader in the child care industry. I am now the Assistant Director at this location and have had both of my young children attend this facility as well. It truly is great to be able to work for a company that, with Rochette and Matt Dahler’s leadership, has expanded across the country, but I feel blessed that I have had the privilege of working at the first Little Sunshine’s Playhouse. I believe that state of the art technology like the Kiddie Kams and LuvNotes lets parents know that they are getting the best care possible for their children and allows parents to still feel connected to their children while they are filling the demands of a busy work schedule. This is a wonderful company with an amazing vision for child care. It has been a pleasure being an employee at Little Sunshine’s Playhouse and Preschool for over a decade as a School Director. Rochette Dahler, has been a wonderful leader and role model. She has taught me so much about the child care industry and I still continue to learn more from her each day. She seems to know exactly how to meet the needs of our customer base and our dedicated professionals. 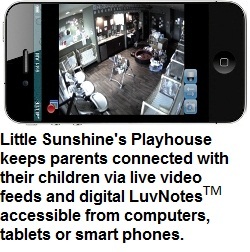 The Kiddie Cams and LuvNotes are just a few of the wonderful services offered to our parents. These services are a huge seller that LSP families love! I have received so many comments on how the LuvNotes daily reports brighten the day of the parents. This service and others help keep the parents connected to their child during day even when they cannot be with them. Thank you Rochette, I appreciate all that you do for the employees, parents and children! I know that you will continue to keep Little Sunshine’s at the top of the childcare industry.